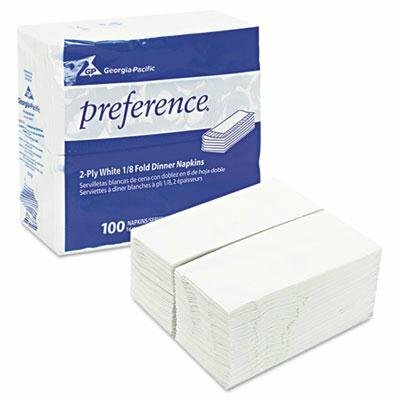 Georgia Pacific Professional - 1/8 Fold Dinner Napkins 15 X 16 White 3000/Carton ''Product Category: Breakroom And Janitorial/Food Service Supplies'' by Georgia Pacific Corp. at Bid Proposal Form. MPN: MSS304643A01. Hurry! Limited time offer. Offer valid only while supplies last. A disposable napkin that speaks to quality and attention to detail. Ideal for better restaurants, resorts, lodging, and healthcare facilities. A disposable napkin that speaks to quality and attention to detail. Ideal for better restaurants, resorts, lodging, and healthcare facilities. Scrollwork pattern, soft hand feel and classy coin edge emboss deliver better patron perception. Protects napkins against spills, moisture and cleaning materials. Material(s): Paper; Color(s): White; Width: 15"; Depth: 16". If you have any questions about this product by Georgia Pacific Corp., contact us by completing and submitting the form below. If you are looking for a specif part number, please include it with your message.